Research in collective memory is a relatively new area capturing the interest of scholars in social psychology, memory, sociology, and anthropology. The core idea is that collective attitudes and behaviors are created and shared through common experiences and communication among a cohort of people. For example, people born between 1940 and 1960 are often defined via the JFK assassination and the Vietnam War. Their parents typically experienced lesser impact from these events. Papers about collective memory have appeared in the literature under different guises for the last hundred years. Freud's Civilization and Its Discontents, Jung's ideas on the collective unconscious, and McDougall's speculation on the group mind posited that identity and action could be viewed as resulting from the shared development of a culture. Halbwachs, a French social psychologist (1877-1945) who was the first to write in detail about the nature of collective memory, argued that basic memory processes were all social. That is, people remember only those events that they have repeated and elaborated in their discussions with others. In the last several years, there has been a resurgence of interest in this general topic because it addresses some fundamental questions about memory and social processes. Work closely related to these questions deals with the nature of autobiographical memory, traumatic experience and reconstructive memory, and social sharing of memories. 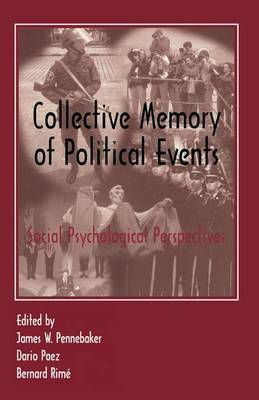 This book brings together an international group of researchers who have been empirically studying some basic tenets of collective memory.